"He better be glad I didn't have a gun," Gainey said. "Because I would have shot him. But this is my gun right here (baseball bat). Because I gone 'Pi-yow!'" 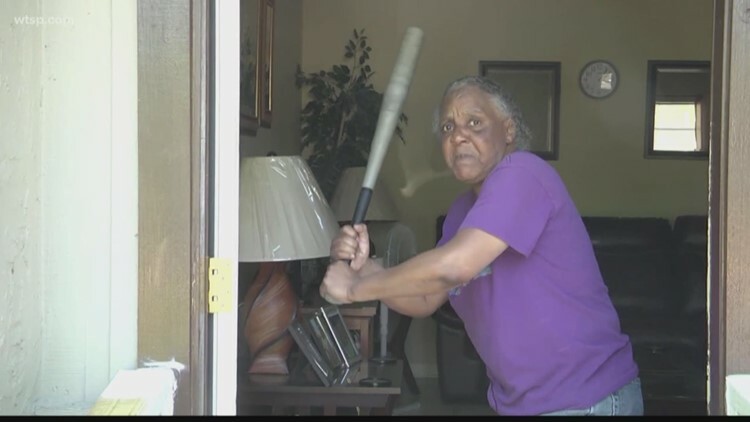 A 65-year-old woman hit a 300-pound, half-naked attacker with a baseball after police said he tried breaking into a car. Clarese Gainey heard a noise outside her apartment Sunday morning, WGFL reports. "I grab my bat, I brace myself, and I ease the door open," Gainey said. Police said Antonio Mosely charged at Gainey. "I took that bat and hit him upside the head like 'pi-yah!' He said 'Ow!'" Gainey said. According to the police, Mosley ran to a nearby mobile home park, leaving behind his pants, a shirt and a sock. A K-9 unit tracked him inside a mobile home where he was wearing a new pair of pants with cocaine in his pocket, WGFL reports. Officers brought Mosely back to Gainey to identify him. She says she could easily identify Mosley by not only his appearance but the injury to his head. Mosley is charged with two counts of burglary and drug possession. Authorities are holding him in the Alachua County Jail.